For the first week or so at the French Prairie Grandma had the room to herself, but a few days after I arrived, a roommate, Martha, moved in. 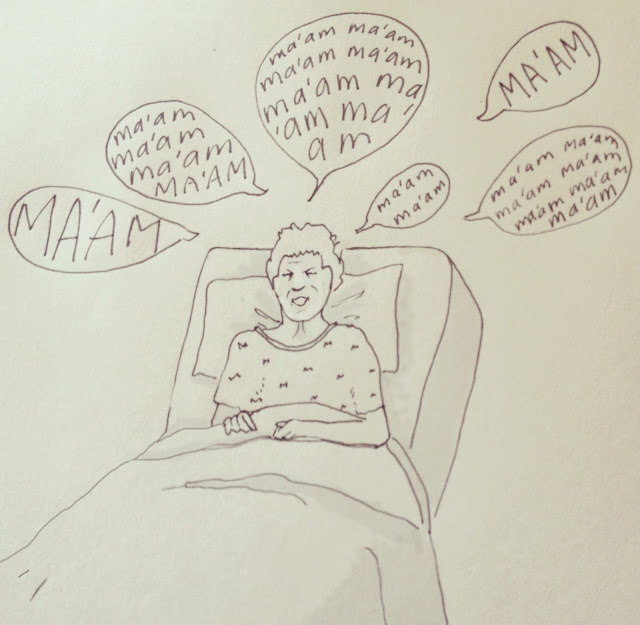 As she was getting settled on the first night, a nurse pointed to Grandma and said, "That's your roommate." Martha said, "That's not my roommate!" These same two lines were repeated with subtle variations a number of times before Martha said angrily, "I have a domestic partner and that's not her!" Then we all understood. It was hard to tell what Martha was in for. She obviously had difficulty making clear sense of some things, but she could also be very polite and coherent. On the second day, she couldn't get the phone to work to call home, so I let her use mine. Once she'd gotten through, it was obvious she was upset with the person on the other end for not coming to see her. Who could blame her? It's a horrible place to be left alone, not knowing when you can go home. It's like a form of jail, but you're not there because you've done anything wrong, your body or your mind has turned against you and now you're paying the price. You have lost all control and are at the mercy of your jailers, in this case doctors and nurses who are ostensibly there to help, but also come with their own agendas. As more time with Martha passed, it became evident that, like so many things, it was complicated. After some odd exchanges with her, I asked a nurse about Martha's condition. She hemmed and hawed and mentioned confidentiality, then gave me a brief explanation that included the word "detox." I got more information through the thin curtain, including that Martha's partner had recently received a DUI and had lost her license. Martha did not take well to the new environment and didn't understand that if you needed something, you pressed the red button. Instead, she would ask me for help or repeatedly yell the word "ma'am." It went like this: "ma'am… ma'am… ma'am… ma'am… ma'am… ma'am… MA'AM… MA'AM… MA'AM… MA'AM…" and so on. Grandma reports that she does this throughout the night. Grandma hears very little, so if she's waking up to this, you know it has to be loud and annoying. All the more reason to break Grandma free!